Georgia quarterback Aaron Murray attempts a pass during last week's 44-41 win over LSU. 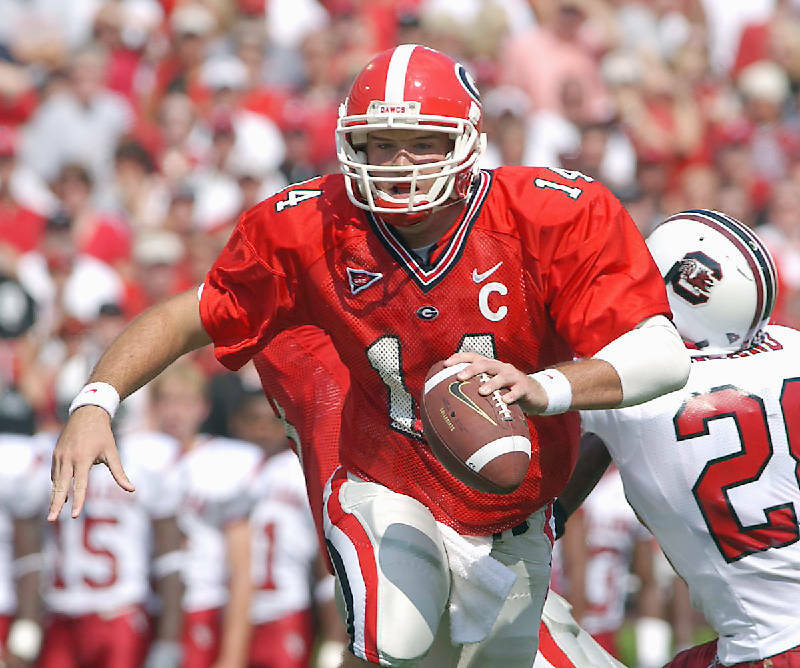 ATHENS, Ga. -- Former Georgia quarterback David Greene is the Southeastern Conference's career passing leader. For at least a few more hours. Current Bulldogs quarterback Aaron Murray will enter Saturday's game at Tennessee needing 100 yards to top the 11,528 that Greene compiled from 2001 to '04. Murray threw for 101 yards in the first quarter of last week's 44-41 win over LSU. "I hope he doesn't just break it. I hope he shatters it," Greene said Thursday. "Georgia really controls its destiny in the East and really needs to play some great football from here on out. I think they've played great football all season, even in the Clemson game, so I hope they continue to get better and I hope he just shatters it. "I have a great feeling he will, as good as this offense has been this year. When that offensive line plays well, I don't think there is anybody who can stop that offense." The Bulldogs set program records last season for yards per game (467.6) and points per game (37.8), but this year's offense is comfortably ahead of those clips. Despite facing three top-10 teams the first month of the season, the Bulldogs have been scorching with 554 yards and 41.2 points per game. Murray has been magnificent, completing 79 of 116 passes for 1,338 yards with 11 touchdowns and three interceptions. The fifth-year senior leads the SEC in yards per game (334.5) and efficiency (191.1), and breaking Greene's league record pales in importance to defeating the Volunteers for a fourth consecutive time. "It's definitely an honor, and it's crazy to think about," Murray said earlier this week. "I've never been a guy who has worried about stats. It's all about winning, winning, winning, but it's definitely an honor to be alongside guys like Greene and Peyton [Manning] and [Danny] Wuerrfel -- guys who just did unbelievable things while they were at their colleges." The 6-foot-1, 208-pounder from Tampa will head to Knoxville coming off what may have been his best game, especially given the attention he and LSU counterpart Zach Mettenberger received. Murray was 20-of-34 for 298 yards and four touchdowns against the Tigers and guided an offense that amassed 494 total yards. "He was on top of everything -- all the checks, all the protections," Georgia coach Mark Richt said. "The balls were extremely accurate. He had very few balls that were not catchable. I can't even hardly think of one. I think what happens is that when you get your expectations so high, unless it's perfect you're not happy. "If he was a second-year guy, we might say, 'Oh, my goodness,' but I think we're getting to the point where we're expecting him to hit every target." Greene texted Murray after the win and told him that everyone in the state of Georgia would remember that game for a long, long time. "When I see people, they still talk about the 'Hobnail Boot' game [at Tennessee in 2001] and the Auburn game [in 2002]," Greene said. "When I was in the middle of it, I didn't think it would be news past the weekend. As a player, you can't enjoy any of it until your time is done. When you're washed up like I am now, you can enjoy these games." Greene finished his career not only as the SEC's all-time leading passer but as the NCAA leader in career victories with 42, a mark that since has been topped. Murray has 31 career wins and won't have the opportunity to match Greene's total in that category, but Murray's 106 career touchdown passes dwarf the 72 Greene had. After attending last week's game with his 5-year-old son, Greene said he will watch the Bulldogs and Murray's expected record-breaking moment on television. "He's approaching Danny Wuerffel's touchdown record [of 114], and I didn't know if that would ever be broken."